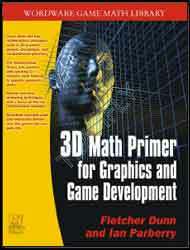 3D Math Primer for Graphics and Game Development covers fundamental 3D math concepts that are especially useful for computer game developers and programmers. The authors discuss the mathematical theory in detail and then provide the geometric interpretation necessary to make 3D math intuitive. Working C++ classes illustrate how to put the techniques into practice, and exercises at the end of each chapter help reinforce the concepts. This book explains basic concepts such as vectors, coordinate spaces, matrices, transformations, Euler angles, homogenous coordinates, geometric primitives, intersection tests, and triangle meshes; discusses orientation in 3D, including thorough coverage of quaternions and a comparison of the advantages and disadvantages of different representation techniques; describes working C++ classes for mathematical and geometric entities and several different matrix classes, each tailored to specific geometric tasks; includes complete derivations for all the primitive transformation matrices. Fletcher Dunn is the principal programmer at Terminal Reality, where he has worked on Nocturne and 4x4 Evolution and is currently lead programmer for BloodRayne. He has developed games for Windows, Mac, Dreamcast, Playstation II, Xbox, and GameCube. Ian Parberry is a professor of computer science at the University of North Texas and is internationally recognized as one of the top academics teaching computer game programming with DirectX. He is also the author of Learn Computer Game Programming with DirectX 7.0 and Introduction to Computer Game Programming with DirectX 8.0.